This fabulous egg nest is from the dinosaur, Oviraptor, or ''egg robber''. Most raptors laid their eggs in nests consisting of a large number of eggs. Oviraptor mothers have been found fossilized guarding their nests, showing a ''nurturing'' nature in these dinosaurs. Usually, hatching and scavenging damaged the nests, obliterating any trace of the eggs that remained. 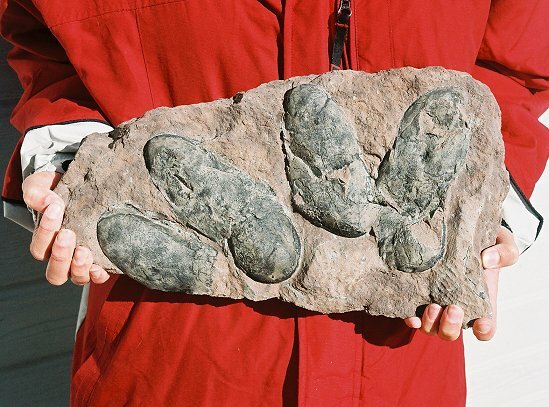 Occasionally, some eggs survived predators and the elements, and eventually became fossils. Another point of interest relating to our raptor eggs is the overall comparison of eggshell thickness of these eggs. The raptor eggs found in deepest deposits (older) have very thick eggshell. As you examine eggs higher in the formation (younger), you see a gradual thinning of the eggshell over time. Gradual changes in vegetation (determined from pollen samples), changes in climate from a humid subtropic to an arid temperate region, and less oxygen in the air (determined from examining air trapped in amber) could have weakened the dinosaurs ability to produce healthy eggs, thus leading to their inevitable extinction. Environmental stresses in modern birds (the brown pelican, for example) have been shown to reduce the thickness of eggshells, and the results on the species are similar. Because of their delicate nature, intact eggs are very rare in the fossil record. Dinosaur eggs that retain their original shape and eggshell are some of the most collectible fossils in the world. This is a museum quality nest of Raptor eggs. The eggs are extremely large and have wonderful form - the original ''egg'' shape is easily seen. The unhatched eggs have much of the thick, black eggshell still intact. The 3-D eggs are extremely inflated and have great color and contrast. The eggs are beautifully presented on the large, UNBROKEN block of matrix. This is a top quality and extremely collectible clutch of fossilized Raptor eggs.